I promise you, this tastes WAY better than it sounds. We’re on a Rachel Ray binge lately, scouring her website and old issues of her magazine for recipes that use produce that’s in season. That’s how we found this one. It gets a 3/5 peppers on my heat scale. The best way I can describe this is that it’s like a healthy chili-taco with a hollowed out zucchini as a shell. It’s a very effective way at sneaking in another serving of veggies and it still tastes phenomenal. * Figure out what size zucchini you want before you buy them. Bigger ones allow more filling, smaller ones allow easier portions for fewer people. 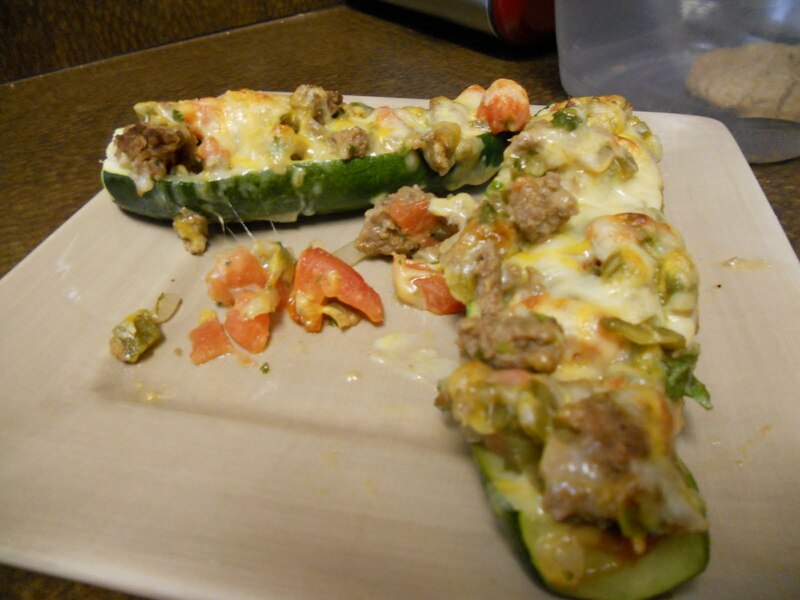 * Substitute fresh jalapenos if you want more heat. Canned ones are good, but the fresher they are the hotter. Leaving seeds in will increase the heat as well, so judge accordingly. * We love cheese, so we piled it on. It’s the most unhealthy thing in this meal, so we figured that’s OK.
* This is a good candidate for lean beef. I’ll try to remember to blog about that sometime soon.